“You’re pathetic,” were the last words John Heden, 45, screamed before he was blown like a rag doll, slipping and sliding in the icy cold across the Mount Washington Observatory deck. Heden was taunting a colleague, forced by gusts of 85 mph to do the crawl of shame back to the door of the building, when he found himself suddenly in the same predicament. He was prepared for freezing temperatures – stuffed inside layers of long underwear, synthetic pants, shirts, an insulated jacket, a wind parka, snow pants, mountaineering boots, balaclava and hat. What he wasn’t ready for was the wind. As his ski goggles blew off his head, he clutched his crumpled glasses and braced himself for the slow-motion move against the rip tide of howling air. Heden had ventured to the summit of Mount Washington to celebrate his son Ryan’s 14th birthday with the observatory’s EduTrip, a $459 overnight excursion to the “home of the world’s worst weather.” The program was a two-day exploration of the mountain summit: a snow tractor ride up the Auto Road, a stay at the non-profit weather observatory, classes, home-cooked meals and frequent trips outside to experience one of the harshest winter environments on the planet. The 85-mph gusts and freezing temperatures, while tame for Mount Washington, were just what the participants hoped for. In 1934, the highest surface wind speed on Earth was recorded here – 231 mph – far exceeding even the speed of a Category 5 hurricane, which tops out at 156 mph. This February, the observatory staff spent 22 days in hurricane-force winds. 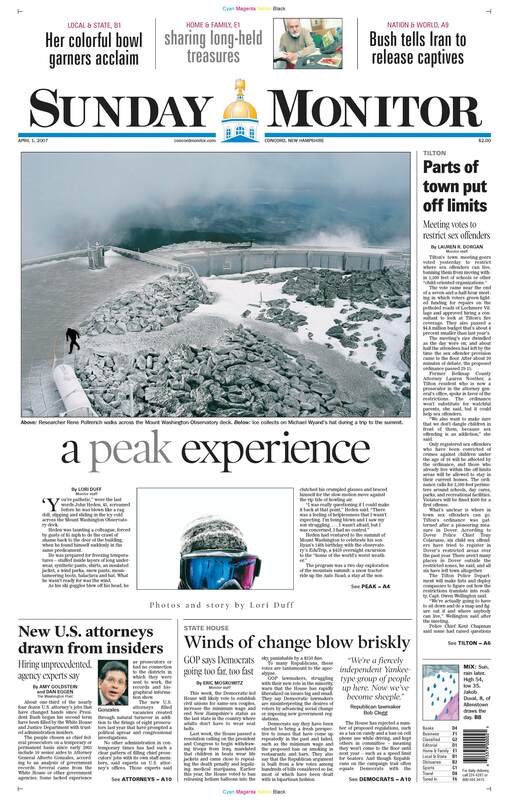 The tough conditions belie the fact that at 6,288 feet, Mount Washington’s peak is really not that tall. In fact, it’s not even the highest summit in the east. By contrast, Pikes Peak, a middle-sized mountain in Colorado, the symbol of the gold rush and the most-visited mountain in North America, stands at 14,110 feet. But because of a convergence of geographical features, including the topography, orientation and rise of the Presidential range, the melding of North American storm tracks and low-pressure ocean systems, winds and weather are pumped straight to the summit. Since 1849, more than 130 people have died on or around the mountain. It was warm at the base of Mount Washington as six EduTrippers and instructors boarded the snow tractor – so warm the snow melted into a blinding fog. The layers of clothing and preparation for disaster seemed out of place at the bottom, with the valley bathed in the early rays of spring. It soon became clear, however, that the weather at the top was a fickle and unpredictable foe. Driver Pete Roberts, 70, has taken hundreds of trips up Mount Washington, but the day’s journey, while safe, he said, was one of the worst. Visibility along the Auto Road was minimal. The mountains were obscured in a thick haze. Entire buildings, trees and rocks disappeared beneath the fog. If someone stepped off a mountain path, he might never find his way back. Balmy temperatures had also turned the snow to slush in hidden rivers of ooze, difficult to see and avoid. Nearly two miles from the top, the vehicle sank in. Roberts revved the motor and narrowly avoided being stuck. “I didn’t think we were going to make it for a minute,” he said. There’s not much wiggle room on the Auto Road, especially in the winter when drifting snow thins the road and makes driving and plowing difficult. Even this year, with less-than-average snowfall, the snow tractor’s rims can hang over the road’s ledge; at times it was a straight drop into the valley below. It’s so dramatic, in fact, that parts of the road have even acquired their own folk names: “Oh, my God, look out” and “Mother-in-law’s Outlook.” The 7.6-mile trip to the top took about two hours. Organizers require participants be in excellent physical condition and suited up for adventure. In case of emergency, they must be ready and equipped to hike to safety. This group was a resilient sort – runners, winter mountaineers, hang gliders, skiers, sailors and lovers of the great outdoors. It’s quiet inside the state park visitors center at the top of the mountain. In the summer, the building bustles, crammed with tourists. But in the winter, only a few hundred hearty souls make it to the top. Vacant tables, framed by windows, look out over the summit with an air of chilly otherworldliness – a haunting picture streaked in white ice and shifting fog. It is like being alone on the moon. As the temperatures dropped from the high 30s to the single digits, fog turned to rime ice and the windows clouded over – blocking the views outside. Participants headed down the long metal stairs under the observatory to the staff living quarters and were greeted by Nin, the resident cat. After a cup of warm coffee, they were briefed on the rules, most importantly on the use of water. With that in mind and a tour of the facility under their belts, it was time for class. Appalachian Mountain Club cartographer Larry Garland blew up a globe while author-historian John Mudge covered the conference room table with maps. Every EduTrip has an educational theme and this one was Mapping Mount Washington. Other trip topics include ecology, mountain climatology, global climate change, geology and alpine photography. The observatory has been a popular place this year, with a host of media outlets clamoring to have a look. The CBS Early Show, Time magazine, National Geographic, the Outdoor Life Network and the Weather Channel have all been up to visit. The young, four-person staff seems at ease with the attention. After all, they are already minor weather celebrities for their morning forecasts and, recently, their widely seen YouTube video, in which boiling water, thrown into the air, is turned to snow by -34.8 degree temperatures – to the sound of rock music. Their official sponsor, L.L. Bean, supplies them with outdoor gear and has featured the summit on national advertising campaigns. Observatory staff members have one of the more unusual jobs on the planet. The crew spends 12-hour shifts, seven days a week, watching and recording the weather yearround. On good days, they have their own winter park with breathtaking vistas and can snowboard or hike outside. Every other week they rotate and go down the mountain for a more normal life. During the evening wine and cheese break, on comfy couches in their bunker-style living quarters below the observatory, staffers admitted to being a bit obsessed with the weather. They talked about whether or not the National Weather Service was overshooting warnings of an impending snowstorm. Meteorologist Ryan Knapp, 26, whose observatory profile says he used to give weather reports to his school ski club, said that a storm is just like a big fish that you are dying to reel in. There was even “shift envy” when one set of observers got “all the good weather,” complained Alan Metcalf, a summit intern, on the observatory website. Unlike New Hampshire’s snow birds who head south for the winter, “good weather” for the staff means getting slammed with the extremes. They enjoy it. Rene Pollrerich, 25, a visiting German researcher, decided to use an infrared camera to test how quickly his body would lose heat in -30 degree temperatures – so he stood outside in his shorts. It was an experiment that didn’t last long. Current researchers form the latest in a long line of scientists who have tracked Mount Washington’s extremes. In 1871, the U.S. Signal Corps began observations here in a building lashed to the ground by chains, the first weather station of its kind in the world. In 1932, the Mount Washington Observatory was founded. The constant observations have culminated in an invaluable record of climatic change and a litmus test for global warming. On this night though, before EduTrip participants headed to their bunk rooms, stories moved away from scientific calculations to tales of the human toll of the mountain. As visiting German researcher Hyun-Ung Lee, 26, moaned the groaning sound of the wind, his colleague Pollrerich repeated an oft-told tale of observatory ghosts. “The voices came from right where you are going to be sleeping,” he began. Voices, it turns out, of two climbers who made it to the top but never made it back down. Overnight the winds died and the clouds cleared off the surrounding mountains. As the sun rose blue and orange and pink, Heden again found himself on the observatory deck, where he struggled on his knees to the door the day before. For the first time, without flying snow, obscuring clouds, deadening winds or blinding fog, he looked back. Heden laughed; for all of his struggles up the floor, he realized he was only footsteps away from the observatory door. participants who decided to walk part of the way down the now-frozen Auto Road. The storm expected for that evening held off, to the disappointment of some, seduced by the mountain and the hope of getting snowed in. “It was a once-in-a-lifetime experience,” Heden said later. At the bottom, Mount Washington looming overhead, layers were stripped off, the adventure completed a bit wistfully.